My friend Lisa asked me when I was going to start posting again as The Ferret. Today? 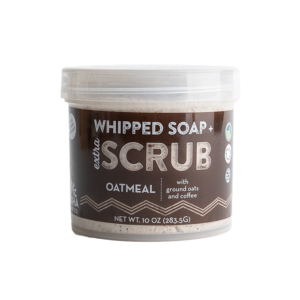 When you find a soap as amazing as Pacha Whipped Scrub, you have to share the news. I have only tried the oatmeal one so far, but I’m in love. Seriously. My skin is so soft. Ever since a girl I didn’t know very well jammed her fingers into my Rosebud Salve, I haven’t been a big fan of any product in a tub or container. And, I thought I heard once “they” say you always get water in containers like that which isn’t great for a closed soap product. So…if I am willing to overlook all of that and ignore my concerns, it must be a great product. It is amazing. The exfoliation is good, but not so strong you feel like you’re scraping off layers of skin. It is just the right amount to get a little exfoliating acting and have your skin feel soft. And, you’ll have a faint smell of an oatmeal cookie to last throughout the day.